Discount 30% on Champa Island Hotel or Cham Oasis Condotel roomrates(not to exceed 2 rooms/night). Discount 20% spa service at Champa Spa (1 service/1 time – not applicable on Champa Package). Discount 10% on F&B service at Champa Garden Restaurant, Apsara Coffee, Karaoke, buffet breakfast at Brahma restaurant or Kubera restaurant(not to exceed group of 20 pax). This card is used by authorised cardholder and not transferable. 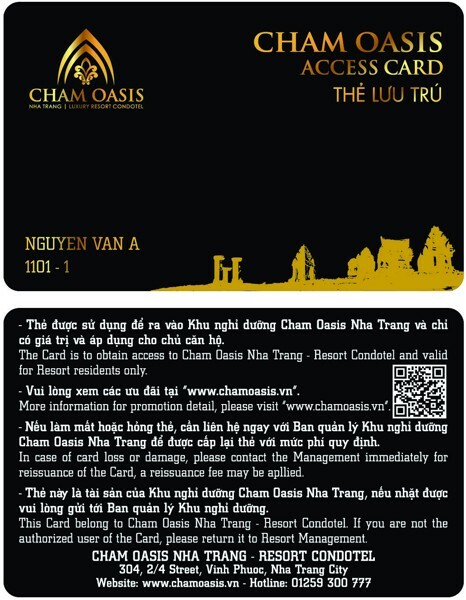 This card is to obtain access to Cham Oasis Nha Trang - Resort Condotel. Must be presented prior to payment. Offes are not in conjunction with any on-going promotions and not available on Tet or public holidays. This card is property of ChampaGroup. If found, please return them to Reception. Offers could be adjusted without prior notice by appropriate time. Có 5 sản phẩm trong nhóm "OFFERS"